And so, the Helter Skelter cake was created. The cake features bunting around each tier, much like the bunting you’ll find decorating booths at the local fairgrounds. The top of the cake features a fairground-type stall decorated with ribbons that turns into a slide that wraps around the cake. 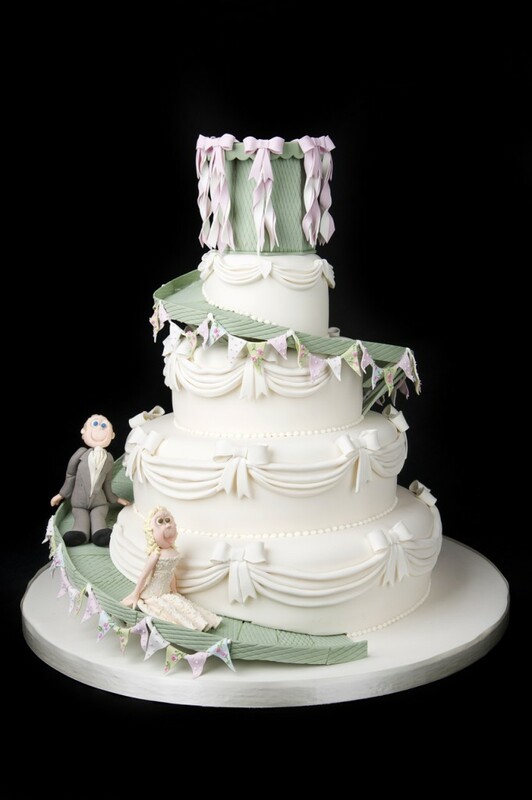 The bride and groom figures – who are sliding down the side of the cake on the slide – were personalized to represent the couple and the outfits they wore on their wedding day. I love this cake for so many reasons – it isn’t your typical wedding cake and you can feel the joy of the wedding day just looking at the cake. Also, it makes me want to go out and find a slide or a county fair – or both! For more amazing designs be sure to visit Hockleys Cakes!